This especially large (and advanced (approximately 20,000 spe­cies, thus the second largest of the flowering plant families in terms of number of species) but agriculturally unimportant family is primarily herbaceous, but all growth forms occur. The leaves are alternate, often in basal rosettes, and exstipulate. The inflorescence is a head that looks like as single flower, composed of tiny flowers inserted on a common receptacle. The flowers are bi-or unisexual, actinomorphic or zygomorphic, 5-merous, and sympetalous. The calyx is absent or rudimentary and modified in a “pappus” of bristles or scales. 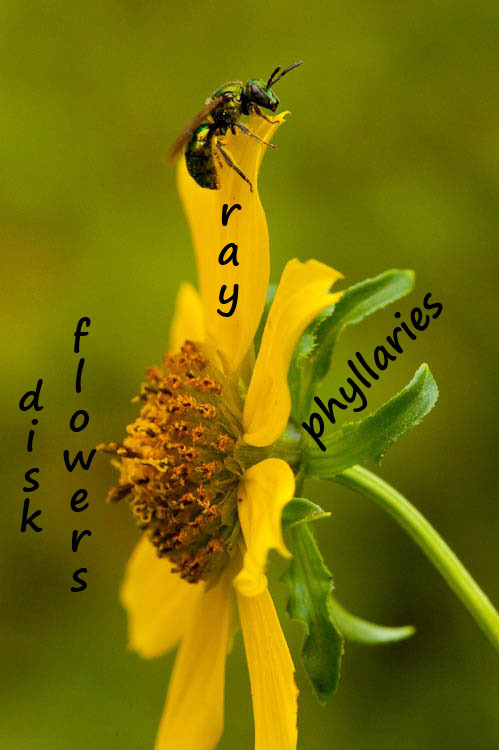 The flowers are of two types: ray (ligulate) and disk (tubular). The androecium is of five stamens united by their anthers, forming a tube around the style. The ovary is inferior and the fruit is an achene. The aster family is fairly popular with gardeners. Asters, chrysanthemums, daisies of many types, and sunflowers are frequently planted. Marigolds are favorite plants of organic gardeners. Their roots contain a substance that is toxic to some root nematodes, although they need to planted as a cover crop to be effective in controlling them. The odor of marigold leaves is said to repel white flies and other insects. A few wild-growing members of the Asteraceae have been used for food or medicine. 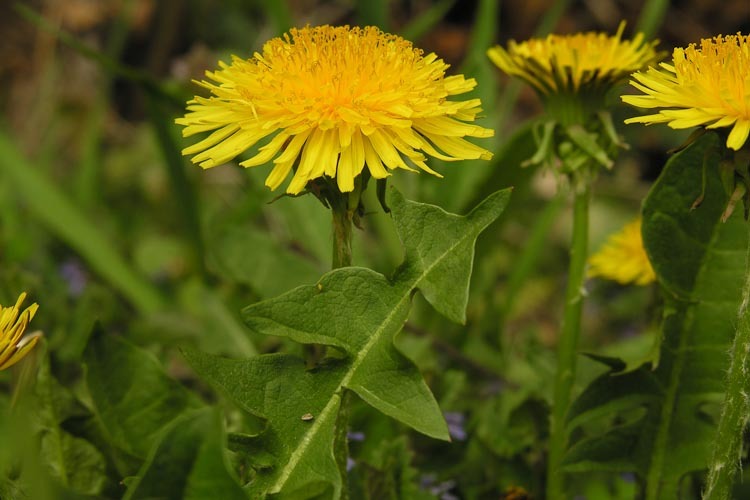 Young leaves of dandelions are often enjoyed in salads, washed down perhaps with dandelion wine made from the flowers. 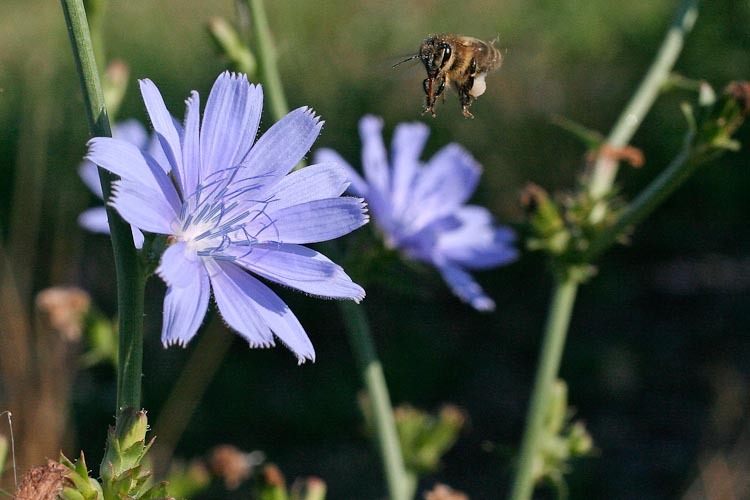 Chicory roots have been used as a coffee substitute, and during World War ll, it was grown as a crop for use as a coffee adulterant. The European yarrow is believed to have been used by Achilles in treating the wounds of his soldiers (hence the name Achillea as the genus of this plant). Sunflowers were widely used by Native Americans for their seeds, which were ground into a flower-like powder for making. Today are grown commercially today, mainly for the oil that is squeezed from the seeds, but also for seeds themselves as a popular snack food. The sunflower inflorescence is “composite” of many individually small flowers. The Asteraceae capitulum is an inflorescence that resembles and individual flower. The aggregation of many small flowers together in compact arrays is an adaptation to facilitate, in effect, an “assembly line” type of pollination. Very efficient. 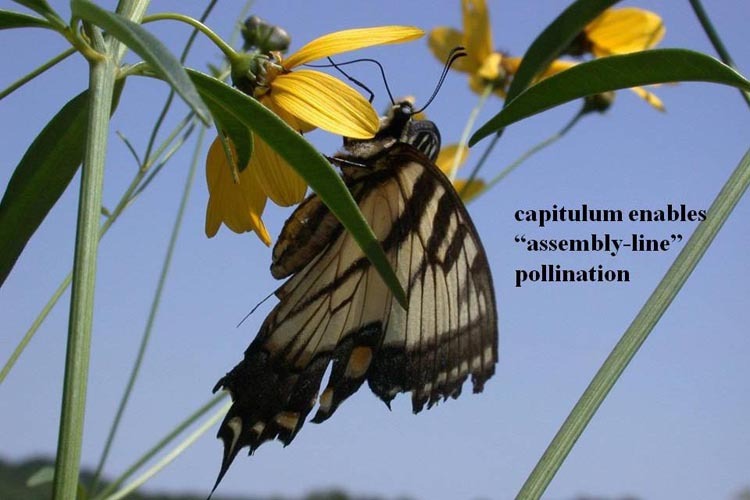 The Asteraceae capitulum enables “assembly line” pollination efficiency. Here’s a capitulum of a sunflower called Jerusalem artichoke, Helianthus tuberosus being merrily visited by a soldier beetle that is probably just eating pollen, not being an effective pollinator (oh, well). Taken indoors, carefully dissected into its component parts, here’s what we see. 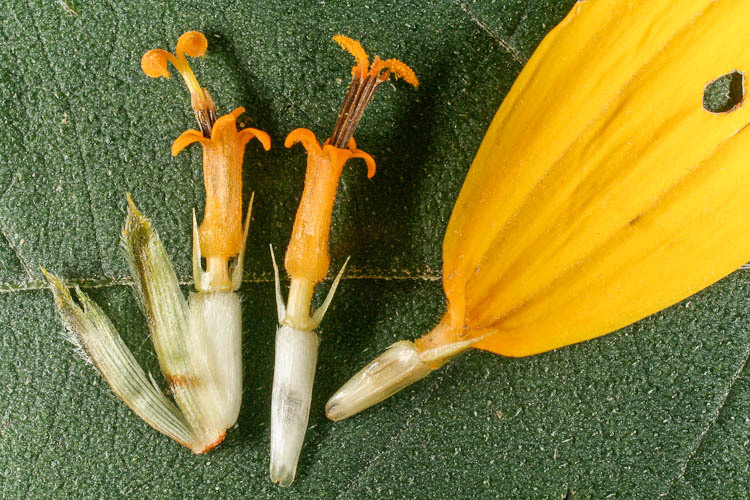 The large(ish) flower on the right is a ray flower that, in this genus, lacks functional sexual parts and serves only to attract pollinators. The other two are the disk flowers, which are perfect (i.e., hermaphroditic, bisexual). 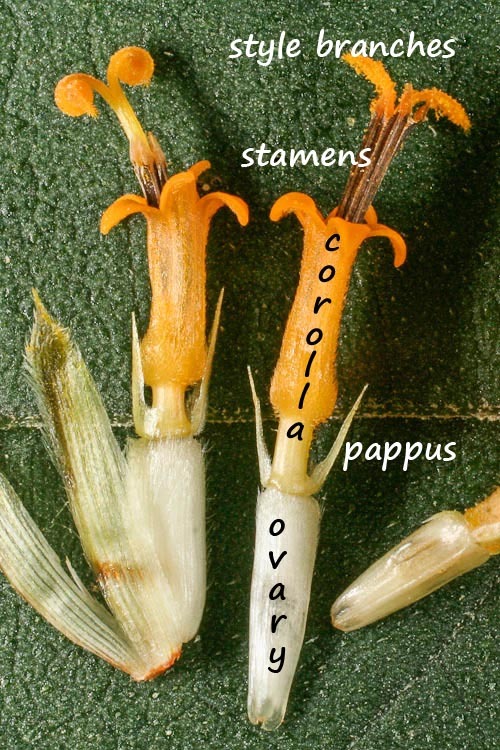 Proceeding from bottom to top, each disk flower consists of the following: an inferior ovary; modified sepals termed a pappus that in this instance consists of two scales; a sympetalous and actinomorphic corolla of 5 fused petals; a set of five stamens that are fused by their anthers into a tube, through and above which extend; a rabbit-ear like pair of style branches. Here are the details. Details of disk flower structure. Notice how the stamens form a tube by the fusion of their anthers (pollen sacs). The split open along the inside of this tube, releasing pollen onto the backs of the style branches as they extend through the tube. 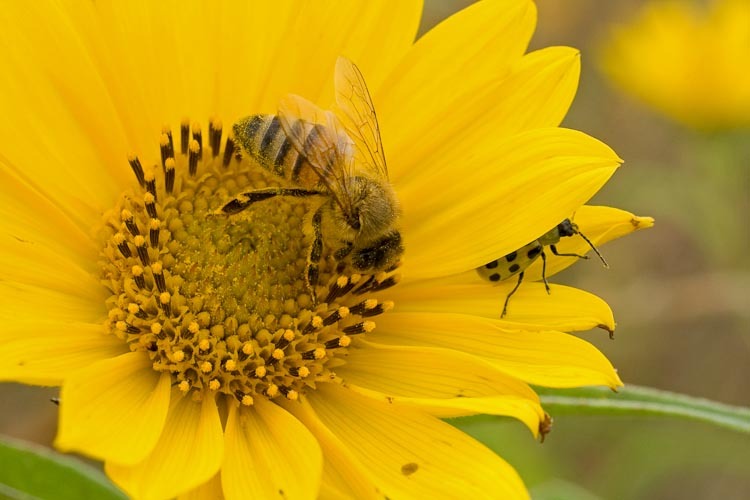 In most instances, because the pollen comes into contact with the non-stigmatic outer surfaces of the styles and also because members of the Asteraceae are typically self-incompatible, this does not constitute self-pollination. 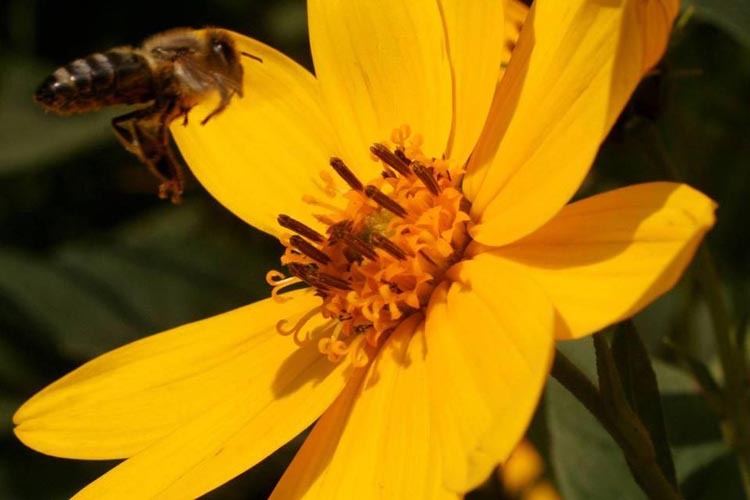 Rather, the pollen is only being presented to insects foraging for pollen and/or nectar, on the backs of the styles. Wild lettuce flowers present pollen on their styles. The fruit type in the Asteraceae is an achene. Dispersal of the fruits is often facilitated by the pappus (modified sepals). 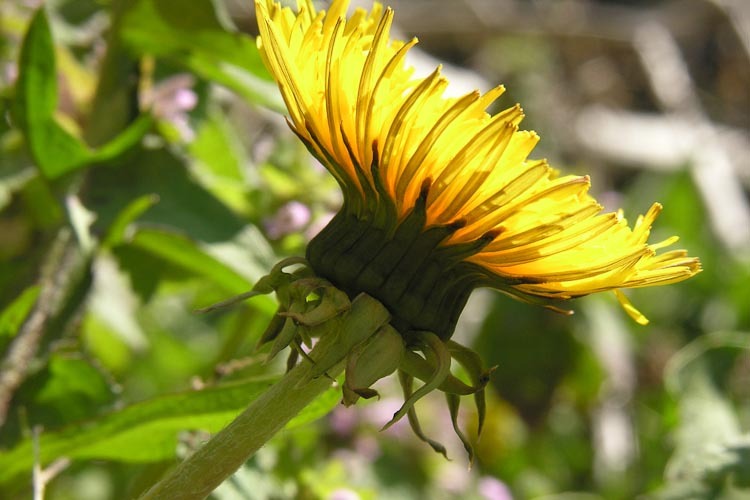 The pappus is quite variable, consisting sometimes of scales (such as in the Helianthus shown above), or bristles of some sort (or be lacking altogether). The most frequent form a pappus takes is to be tufts of hair-like bristles that act like a parachute/hang glider sort of thing to enable wind dispersal. 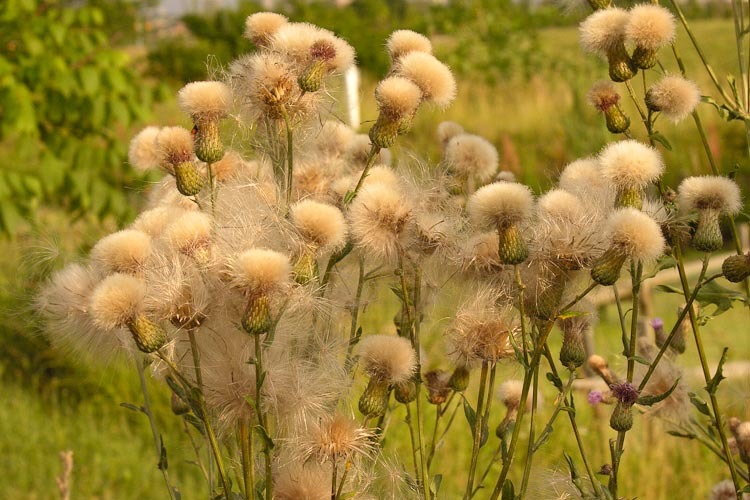 Goatsbeard fruits are wind-dispersed, helped by a plume-like pappus. 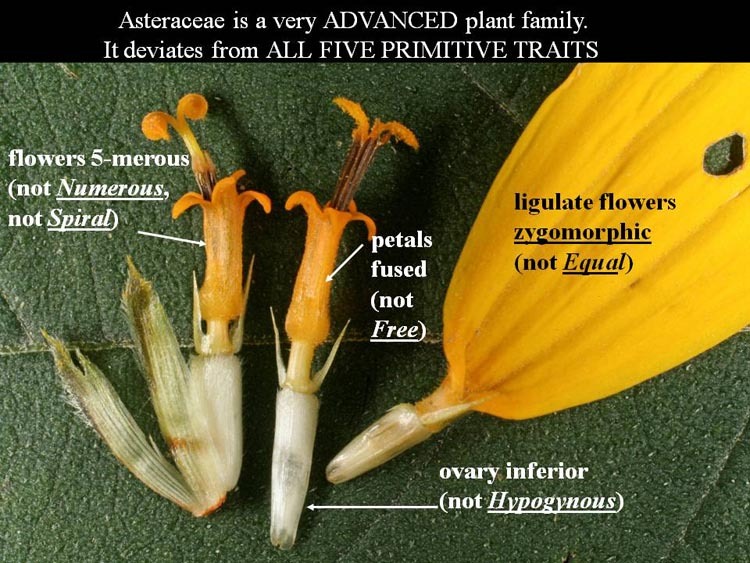 The Asteraceae is a very advanced plant family. It departs, when you consider the strongly zygomorphic strap-shaped ligulate/ray flowers, from ALL FIVE traits of primitive flowers. F E N S H ! Noddng beggar-ticks has a radiate capitulum. 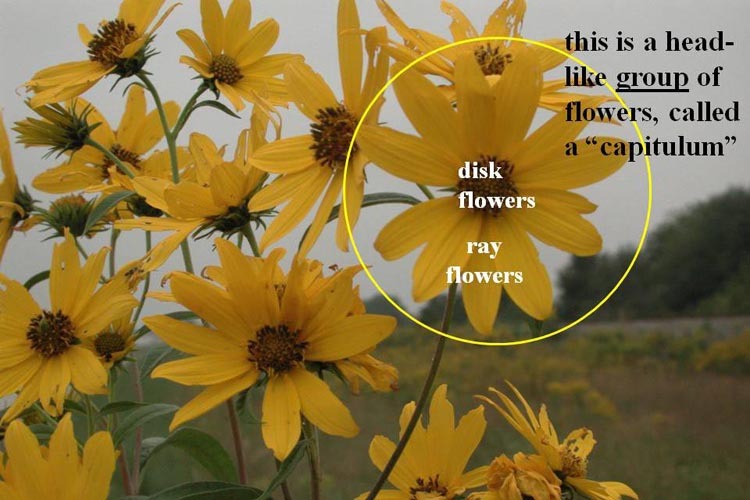 Both ray and disk flowers are present. Pasture thistle has a discoid capitulum. Only disk flowers are present. Chichory produces a ligulate capitulum. Only ligulate (“ray”) flowers are present. 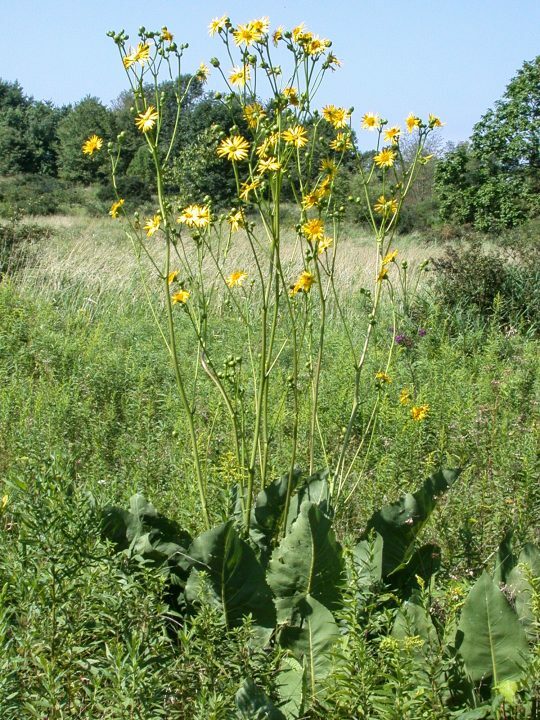 Prairie dock, Silphium terebinthinaceum, is the signature wildflower of Ohio’s tallgrass prairie. It is a long-lived, deep-rooted perennial with huge basal leaves. Prairie-dock is a tall plant with large basal leaves. It is the signature wildflower of the tallgrass prairie. Another tall composite found in prairies as well as well as roadsides and meadows is sawtooth sunflower, Helianthus grosseserratus. 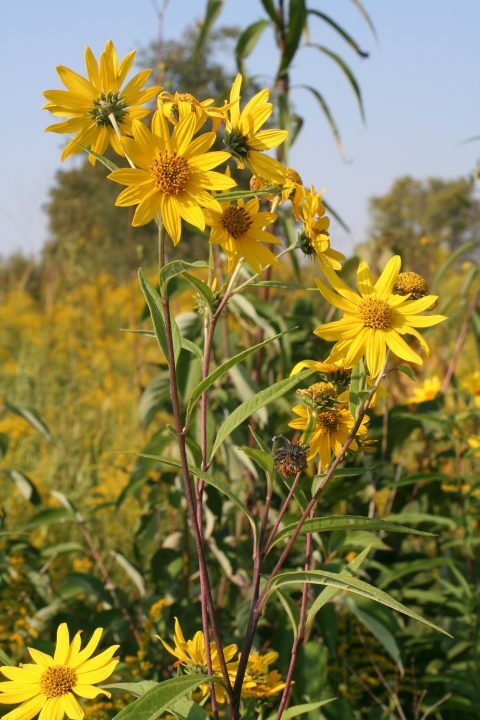 Sawtooth sunflower is a tall late-summer wildflower with narrow toothed leaves. The genus Sececio, in our area, includes yellow-flowered, mostly radiate herbs. 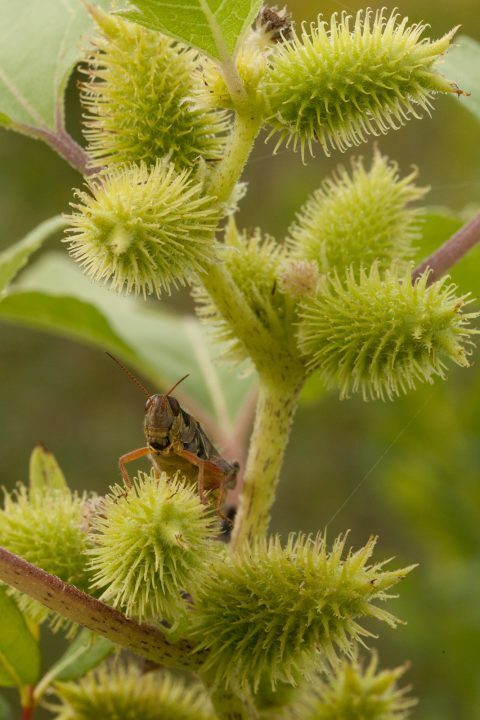 In the past few decade or so, a weedy one native to the southeastern U.S. has shown up here in abundance in farm fields in spring. 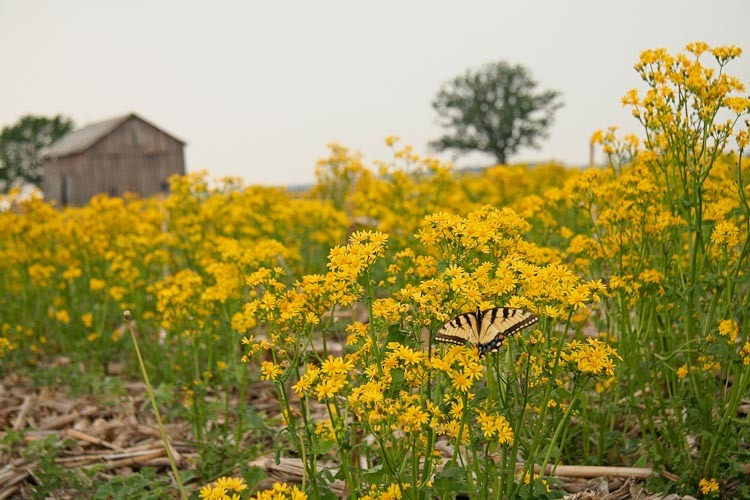 Butterweed is an abundant weed in farm fields in spring. Here’s a closer view of butterweed. Note the column of fused stamens protruding from some of the disk flowers. Butterweed has a radiate capitulum. There’s a lovely native Senecio called golden ragwort. 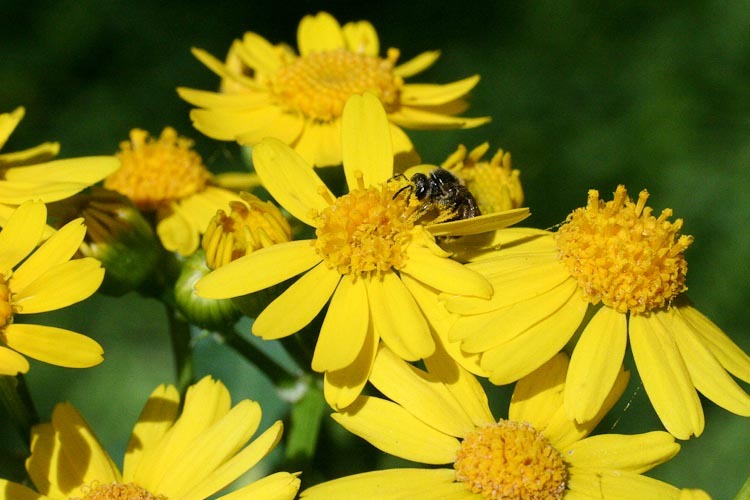 Senecio aureus is found in prairies and open moist woods, where it flowers in April-May. 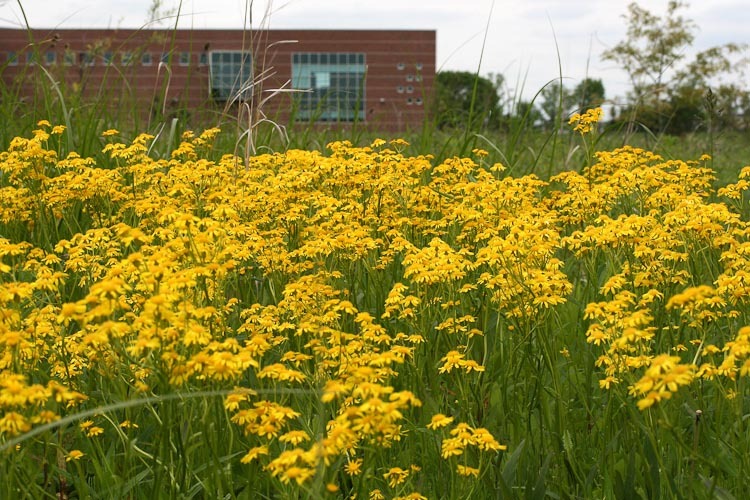 Golden ragwort is a native prairie wildflower. Daisy fleabane, Erigeron philadelphicus, is a native plant that is nonetheless a bit on the weedy side. This genus has many very narrow white rays, and a yellow disk. 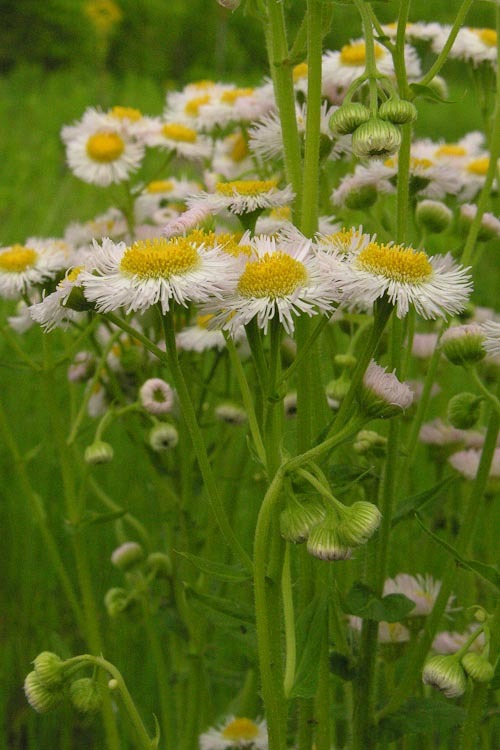 Daisy fleabane is a weedy spring-flowering plant. 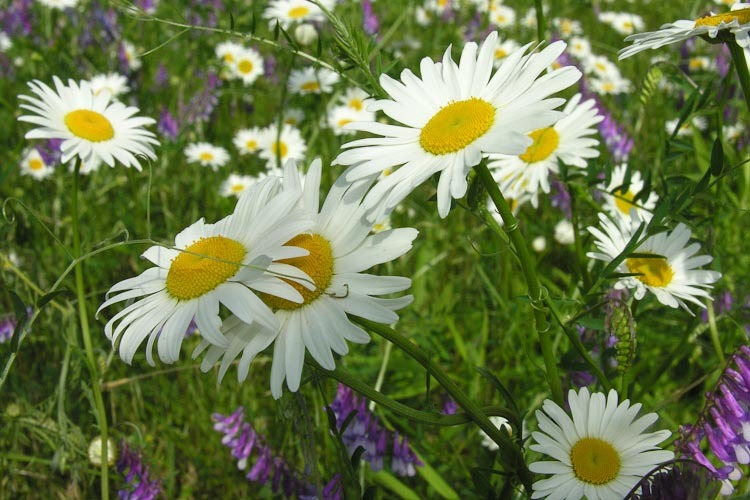 Ox-eye daisy, Chrysanthemum leucanthemum, has comparatively few, wider rays. 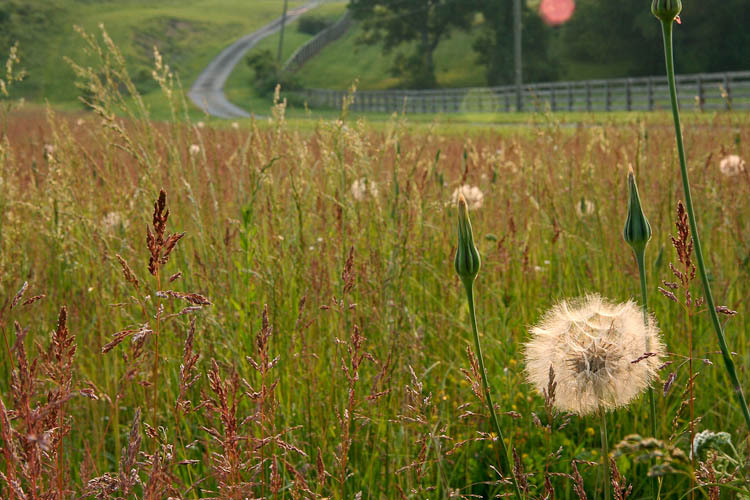 It’s a roadside and meadow weed. The name “daisy” comes from some Old English word meaning “day’s eye,” because the rays of a similar plant open at daybreak. Ox-eye daisy is roadside weed. 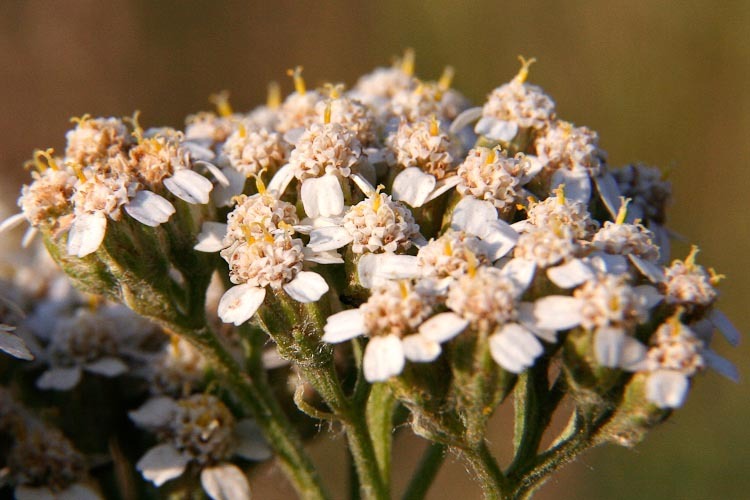 Yarrow is a weedy plant with small white radiate capitula. 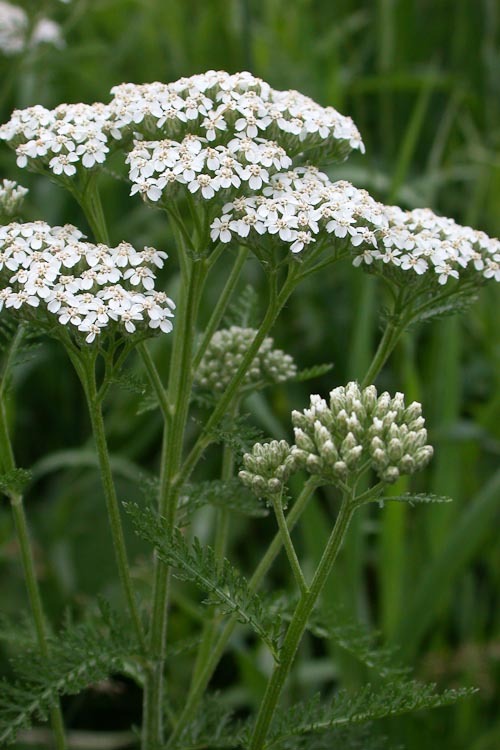 Again, this is the plant believed to have been used by Achilles in treating the wounds of his soldiers (hence the name Achillea as the genus of this plant). Yarrow is a biennial herb with small white flower heads. The capitula are small, radiate. Yarrow capitula are small and numerous. 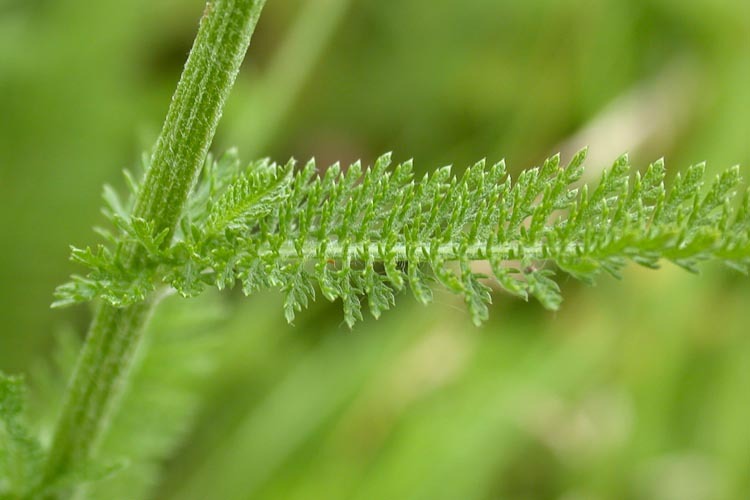 The leaves of yarrow are finely divided. Yarrow leaves are finely divided. Some “rayless composites” (Asteracaeae with discoid capitula) belong to genera within which most members have a radiate capitulum. Often these are self-pollinating annuals, such as this common groundsel, Senecio vulgaris. 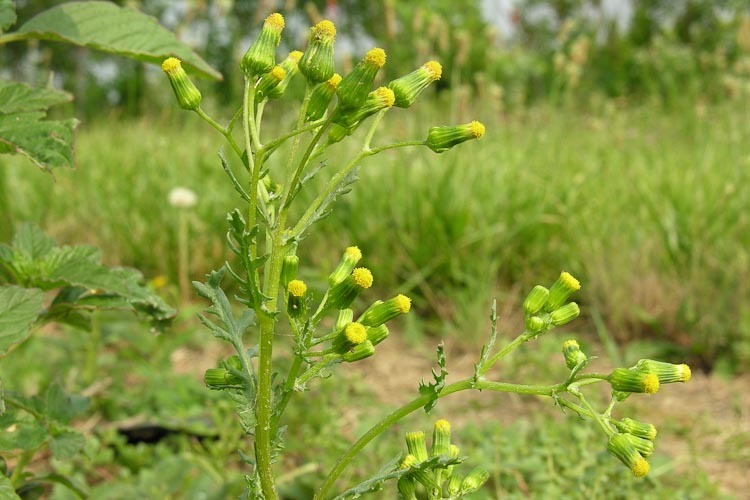 Common groundsel is a selfing annual rayless composite. Other members of the family are in genera that are wholly composed of discoid species, and that are showy outcrossers.Thistles are an example. This is Canada thistle, an obnoxious weed that is misnamed, being a European, not native North American, species. This is a good example of a species that has wind-dispersed fruits with a fluffy pappus (SLIDE). 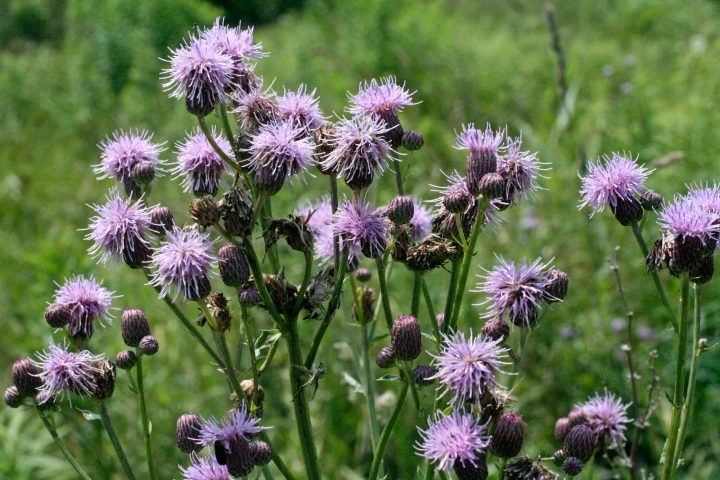 Canada thistle is a weedy species invading prairies and meadows. Asteraceae with ligulate capitula form a distinctive group. Unlike the rays of heads of radiate species, which are most often neuter flowers that attract pollinators to the head where they will deliver pollen to and from the fertile disk flowers, these ligulate flowers are fertile and bisexual, i.e., having both a pistil and stamens. Here’s a cross-section of the radiate capitulum of sow-thistle, Sonchus arvensis. Note that all the flowers are alike and bisexual. Note: the tubular flowers in the center of the capitulum are unopened flower buds, not disk flowers. Sow-thistle has a ligulate capitulum. 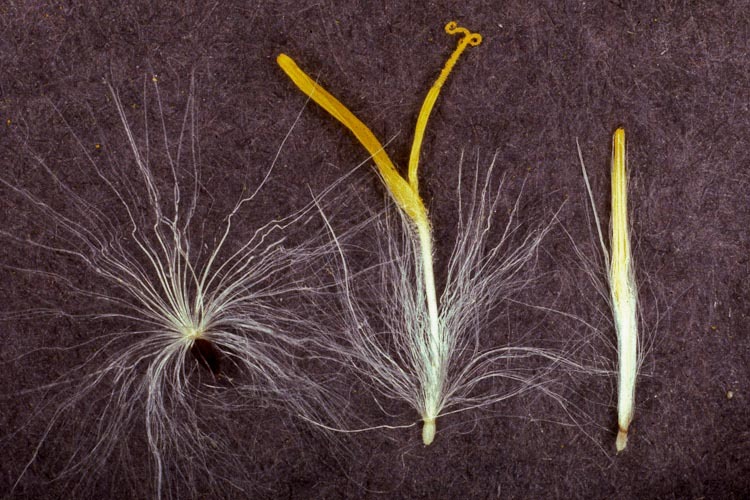 Below, see several separate sow-thistle flowers in various stages of development. 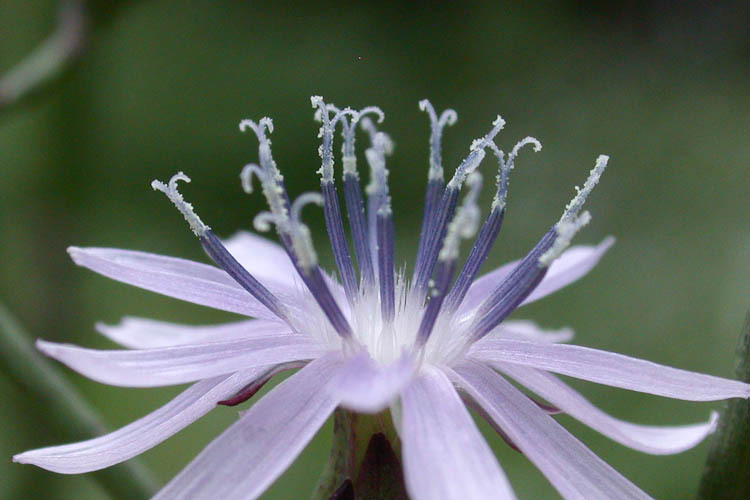 Note that sow-thistle has a pappus of numerous hair-like bristles, to effect wind dispersal of the fruit, an achene. Left: achene with pappus. Center: flower. Right: bud. Here’s a sow-thistle (Sonchus oleraceus) plant. Note the ligulate capitula that are somewhat dandelion-like. 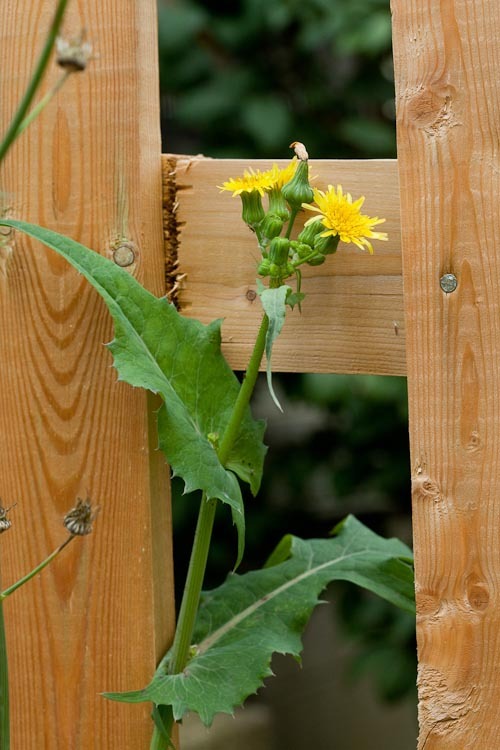 Sow-thistle has clasping, sharp-toothed leaves. The most familiar plant with a ligulate capitulum is perhaps the most familiar plant there is: the dandelion.The name comes from an old French name for the plant dent-de-lion, meaning “teeth of the lion,” based on the coarsely toothed leaves. Dandelion is a weed with a ligulate capitulum. 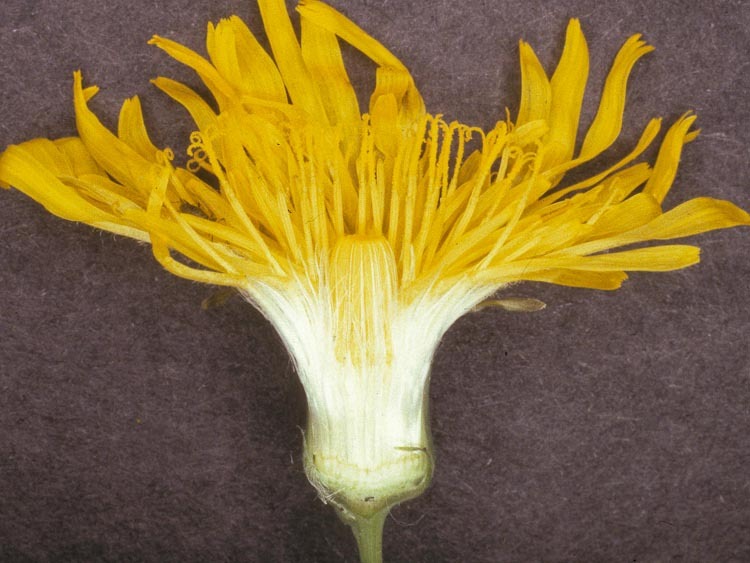 The dandelion capitulum is subtended by prominent involucral bracts (phyllaries), some of which are bent back (reflexed) while others are upright. Dandelion phyllaries are prominent, in two sets. 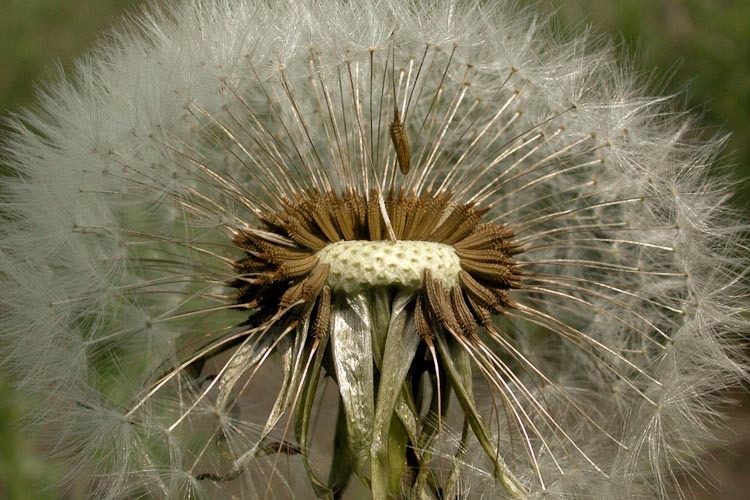 In fruit, dandelion achenes are blown away from the smooth receptacle, wind dispersal enables by the plumose pappus. Dandelion fruits are achenes topped by a plumose pappus. 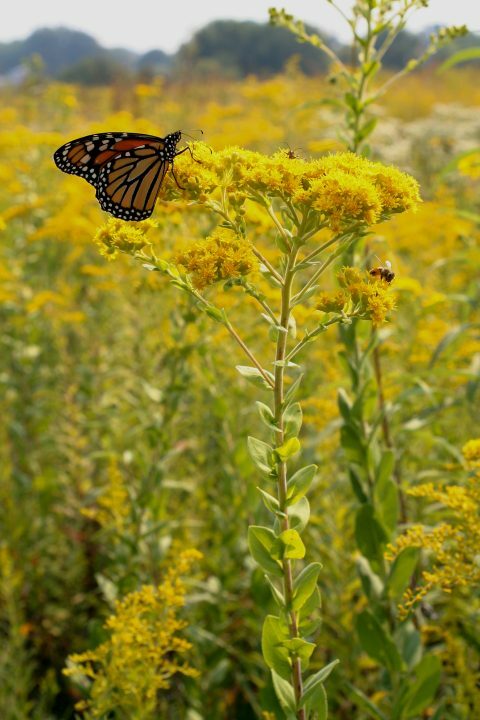 Stiff goldenrod, Solidago rigida, is a prairie wildflower. Cocklebur, Xanthium strumarium, is a weedy native annual of disturbed sites. 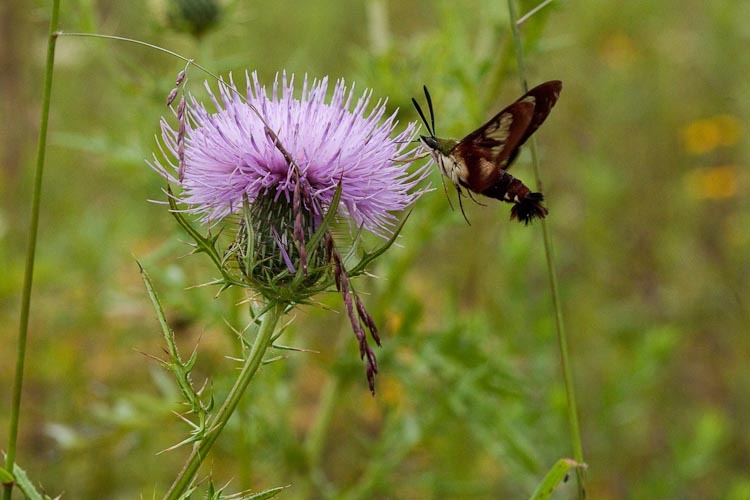 Canada thistle, despite the common name, is not native to North America but is a serious weed in prairie restorations.